I was an early adopter of Gmail, so I have a fairly short and simple Gmail address. Unfortunately, that means it’s only a typo away from plenty of other short Gmail addresses, so I get a fair amount of email intended for someone else because of misspellings. 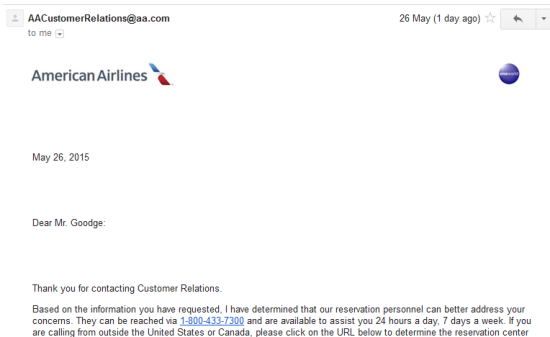 I also get a lot of email intended for someone else because they wrongly believe that they own my email address. I have no idea why they think that, but it seems to happen a lot. 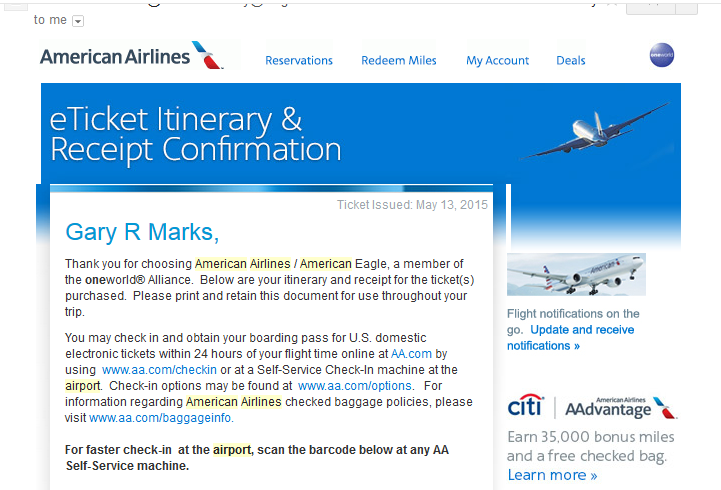 That, as you can see, is an American Airlines e-ticket. Obviously, the fact that I got it means that the intended traveller didn’t, which means that unless he sorts it out he won’t be taking his flight. He must have realised that himself, because about a week later I got the same e-ticket again. I presume he had phoned customer services and complained about not getting it, so they had helpfully re-sent it. Except, of course, they re-sent it to the same, wrong address, so he still didn’t get it. I have no idea why this has been sent to my email address, as I am not Gary Marks and I did not buy this ticket. Please can you amend your records. Thank you for contacting Customer Relations. Based on the information you have requested, I have determined that our reservation personnel can better address your concerns. They can be reached via 1-800-433-7300 and are available to assist you 24 hours a day, 7 days a week. If you are calling from outside the United States or Canada, please click on the URL below to determine the reservation center or General Sales Agent nearest you. 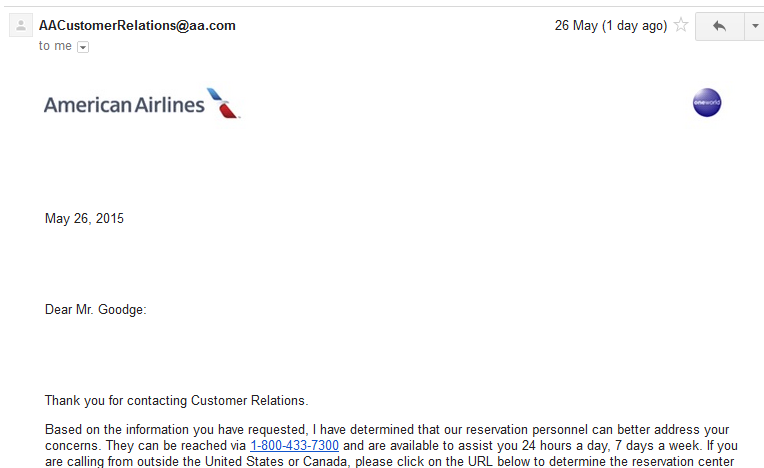 Please have your flight details readily available to provide the representative. Should you require similar assistance with reservations in the future, we recommend you call the above number for a more expeditious response. We have an around-the-clock dedicated staff of professionals eager to resolve concerns for customers holding open reservations. If you still have questions or concerns after your trip is completed, we’d be happy to hear from you in Customer Relations. Mr. Goodge, thank you for bringing this to our attention. This is the wrong response on so many levels that I don’t really know where to start. So I might as well end with this.